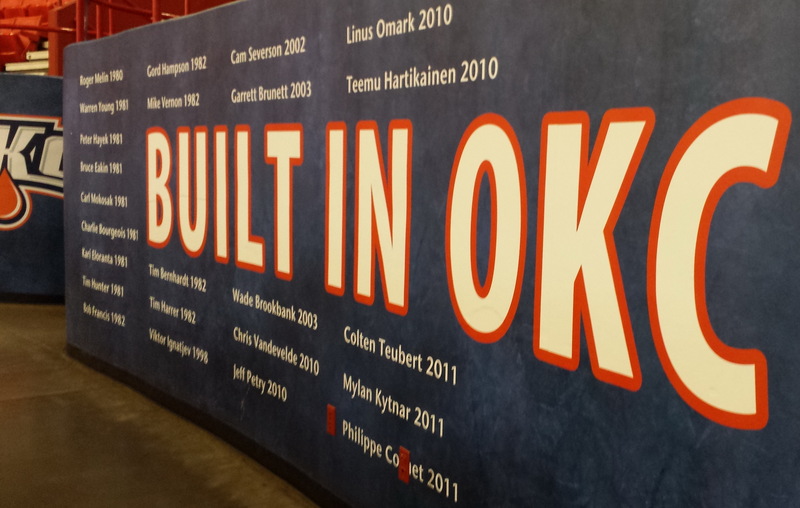 What a great five-season run for the OKC Barons! While OKC hockey fans were heartbroken to see the team depart we will always have great memories of those five seasons and their playoffs. In the AHL fans grow attached to the players and coaches and keep track of them for the remainder of their careers. Their travels often lead us to all parts of the globe, and sometimes even very close to home. In 2014 we cheered for former OKC Barons goaltender David LeNeveu as he represented the New York Rangers in the NHL Stanley Cup Final playoffs. In 2015 we cheered for (and even promoted for future hire!) our astute and candid head coach Todd Nelson as he took over the Edmonton Oilers bench for part of the season. Later in 2016 we cheered as our big tough Finn Teemu Hartikainen and our flashy Swede Linus Omark went to the Eastern Conference Finals in the KHL. Updated: September 28, 2018, with most recent updates in BOLD. Nelson, Todd, Head Coach – (2010-11 through most of 2014-15) May 31, 2018: Named Assistant Coach to Dallas Stars (NHL); June 19, 2015: Named Head Coach of the Grand Rapids Griffins; July 15, 2010: Named Head Coach of the new OKC Barons (AHL). Thompson, Rocky, Assistant Coach – (2010-11 through 2013-14) June 7, 2017: Named head coach of the Vegas Golden Knights AHL affiliate Chicago Wolves; July 3, 2015: Named Head Coach of Windsor Spitfires (OHL); July 19, 2014: Named Assistant Coach of the Edmonton Oilers (NHL). Fleming, Gerry, Assistant Coach, then Head Coach – (2010-11 through 2014-15) May 25, 2018: Named Assistant Coach for Eisbären Berlin (DEL); Apr. 17, 2018: No longer coach for Bakersfield Condors (AHL); July 4, 2014: Head Coach Bakersfield Condors, Edmonton Oilers will retain Fleming for AHL job; December 15, 2014: Named Head Coach of the OKC Barons. Scott, Bill, General Manager – (2010-11 through 2013-14) August 2, 2016: Moved to Director of Salary Cap Management and Assistant to the President of Hockey Operations for the Edmonton Oilers; April 21, 2014: Named Assistant General Manager of the Edmonton Oilers. Byers, Jim, Barons broadcaster, play-by-play – (2010-11 through 2014-15) 2015: Byers has returned to horseracing as Track Announcer at Lone Star Park, Grand Prairie, TX. Abney, Cameron – (part of 2011-12; 2012-13) Retired; Sept. 24, 2014: Signs with Gwinnett Gladiators (ECHL); Feb.-Mar. 2014: With Orlando Solar Bears (Maple Leaf ECHL affiliate); Jan. 31, 2014: Oilers trade to Toronto Maples Leafs; Oct. 2, 2013: Oilers Reassigned to the Bakersfield Condors (ECHL). Acton, Will – (Parts of 2013-14 and 2014-14) Dec. 10, 2015: Signs 3-year extension through 2018-19 with Schwenninger Wild Wings (DEL); Sept. 28, 2015: Signs with Schwenninger Wild Wings (DEL). Aliu, Akim – (PTO: 1 game in 2014-15) Feb. 15, 2018: Loaned to IK Pantern (Allsvenskan); Jan. 16, 2018: Signs with Karlskrona HK (SHL); Dec. 12, 2017: Signs remainder of season with HC Banska Bystrica (Slovakia); Feb. 4, 2017: Traded to Atlanta Gladiators #ECHL); Feb. 4, 2017: Traded to Rapid City Rush (ECHL); Jan. 25, 2017: Traded to Elmira Jackals (ECHL); Dec. 6, 2016: Signs with Florida Everblades (ECHL); Nov. 6, 2015: Signs with Amur Kabarovsk (KHL); March 12, 2015: Bakersfield ECHL trades rights to Orlando Solar Bears. Arcobello, Mark – (part of 2010-11; 2011-12; 2012-13; part of 2013-14) May 9, 2017: Re-signs for 2-years with HC Bern (NLA) without NHL-clause through 2018-19; May 31, 2016: Signs 2-year contract with HC Bern (NLA) with 1-way NHL out clause through 2017-18; July 1, 2015: Signs 1-year with Toronto Maple Leafs; May 2015: Member of Team USA at IIHF Worlds; Feb. 11, 2015: Arizona Coyotes claim off waivers; Jan. 14, 2015: Pittsburgh Penguins claim Arcobello off waivers; Dec. 29, 2014: Edmonton Oilers trade to Nashville Predators. Aulie, Keith – (8 games in 2014-15) May 7, 2018: Re-signs 1-year with Red Bull München (DEL); Dec. 15, 2017: Signs with Red Bull München (DEL); Oct. 18, 2017: Signs PTO with Chicago Wolves (AHL); Jan. 9, 2017: Signs AHL contract with Stockton Heat; Nov. 3, 2016: Signs PTO with Stockton Heat; Sept. 21, 2016: Tryout with Columbus Blue Jackets (NHL); Jan. 3, 2016: Signs with HIFK (Liiga); Nov. 3, 2015: Signs PTO with Springfield Falcons (AHL). Bachman, Richard – (2013-14; 2014-15) Jun. 20, 2018: Re-signs 2 years (2-way) through 2019-20 with Vancouver Canucks (NHL); July 13, 2016: Extends contract 1-year (2-way) through 2017-18 with Vancouver Canucks; July 1, 2015: Signs 2-years with Vancouver Canucks – 2015-16 – 2016-17. Belle, Shawn – (part of 2010-11) Retired: July 23, 2015: Retires to coach in AJHL; Nov. 10, 2014: Signs with Düsseldorfer EG; August 31, 2014: Released from Medvescak Zagreb (KHL) due to injury; June 16, 2014: Signs with Medvescak Zagreb (KHL); April 28, 2014: Departs Färjestad (SHL); June 10: Signs with Färjestad (SHL). Belov, Anton – (paper transaction in 2013-14, no games) May 22, 2018: Re-signs for 3-years with SKA St. Petersburg (KHL) through 2021; April 16, 2014: Signs 4-year contract with SKA St. Petersburg (KHL) through 2017-18; Dec. 5. 2013: Edmonton Oilers reassigned him to OKC on Dec. 5, and recalled him on Dec. 6 in a paper transaction to make room on the NHL roster. Broda, Joel – (Loaned to OKC; Played 8 games 2013-14) July 9, 2018: Signs with Dornbirner EC (EBEL); Mar. 28, 2017: Re-signs 1-year with EHC Linz (EBEL); April 22, 2016: Signs with EHC Linz (Austria); August 29, 2015: Signs with HC Bolzano (Austria); August 19, 2014: Signs with Hershey Bears; Aug. 15, 2013: Signs with Bakersfield Condors (ECHL). Brossoit, Laurent – (8 games in 2013-14; 2014-15) July 1, 2018: Signs 1-year with Winnipeg Jets (NHL); Edmonton Oilers/Bakersfield Condors through 2017-18. Brulé, Gilbert – (part of 2011-12) Sept. 5, 2017: Traded to Kunlun Red Star (KHL); July 17, 2017: Traded to Traktor Chelyabinsk (KHL); Oct. 12, 2016: Signs 2 years with Neftekhimik Nizhnekamsk (KHL) through 2017-18, traded from Zagreb for monetary compensation; April 18, 2016: Re-signs with Medveščak Zagreb (KHL); July 18, 2015: signs with Medveščak Zagreb (KHL); May 12, 2014: Signs with Avtomobilist Yekaterinburg (KHL); Jan. 1,2014: Informs Coyotes he is retiring; Jan 7, 2014: Released from Phoenix Coyotes; Oct. 11: Signs a PTO with the Portland Pirates (Coyotes AHL team); Sept 26: Released from tryout (training camp) with the Phoenix Coyotes. No current team. Bryzgalov, Ilya – (2 games in 2013-14 on Conditioning stint) Retired; Dec. 9, 2014: Signs with Anaheim Ducks; Sept. 18, 2014: Tryout with Minnesota Wild (NHL); March 4, 2014: Traded to Minnesota Wild; Nov. 11, 2013: Sent to OKC on Conditioning stint from Edmonton Oilers. Bunz, Tyler – (2012-13 through 2014-15) Retired; Spent 2014-15 season with Wichita Thunder (ECHL), with 2 games in OKC and 1 game in NHL with Edmonton Oilers. Burgdoerfer, Erik – (3 games in 2013-14) July 1, 2017: Signs 2-year 2-way contract with Ottawa Senators through 2018-19; July 21, 2016: Signs 1-year 2-way contract with Buffalo Sabres (NHL); May 18, 2015: Re-signs for 1-year Hershey Bears (AHL); August 6, 2014: Signs 1-year AHL contract with the Hershey Bears (AHL). Byers, Dane – (part of 2012-13) May 30, 2018: Re-signs with Manchester Storm (EIHL); June 1, 2017: Signs with Manchester Storm (EIHL); May 23, 2016: Signs with Kölner Haie (DEL); Oct. 12, 2015: Signs with Pelicans (Liiga); Sept. 22, 2015: Tryout with St. Ilves (Liiga); May 16, 2014: Re-signs with Hershey Bears for next season; June 26, 2013: Signs with Hershey Bears, 1-yr AHL contract – Captain of team; April 2, 2013: Traded by the EDM Oilers to the WSH Capitals (Hershey Bears). Campbell, Darcy – ( PTO 2011-12; 2 games) Retired: July 29, 2013: Signs with Val Pusteria (Brunico) (Italy). Campbell, Scott – (PTO 2010-11, Backup goaltender, no games) Retired: Inactive since 2010-11. Chase, Greg – (5 games in 2013-15; 2014-15) Aug. 30, 2018: Signs with Wichita Thunder (ECHL) [Aug. 20: Tryout with Chicago Wolves (AHL)]; Dec. 19, 2017: Traded to the Florida Panthers (NHL/AHL); Sept. 13, 2014: Edmonton Oilers signed to 3-yr ELC through 2017-18. Cheechoo, Jonathan – (part of 2012-13) Retired (Mar. 6, 2018): May 10, 2016: Signs 1-year with HC Slovan Bratislava (KHL); May 5, 2014 (2 yrs): Signs with Dinamo Minsk (KHL) for 2 seasons; April 25, 2014: Re-signs with Medveščak Zagreb KHL; July 9: signs with Medveščak Zagreb KHL. Chorney, Taylor – (2010-11; most of 2011-12) Jul. 7, 2018: Signs 1 year (plus option) with Lugano (NLA); Feb. 21, 2018: Claimed off waivers by Columbus Blue Jackets (NHL); February 19, 2016: Re-signs 2-yrs with Washington Capitals (2016-17/2017-18); July 1, 2015: Signs a 1-year contract with the Washington Capitals; July 1, 2014: Signs 1-yr 2-way with Pittsburgh Penguins; June 18, 2013: Re-signs with St. Louis Blues, 1-yr 2-way (Chicago Wolves = Captain). Clark, Brett – (part of 2013) Retired: Sept. 16, 2014: Announces his retirement and joins Colorado Avalanche as Player Development Consultant; Dec. 6, 2013: Signs PTO with Lake Erie Monsters (AHL); Sept. 21: Released from Florida Panthers Training Camp. No current team. Collins, Dusty – (2010-11 – 4 games in 2011) Retired; Inactive since 2010-11. Cornet, Philippe – (2010-11; 2011-12; 2012-13) Apr. 27, 2018: Re-signs with HPK (Liiga); Nov. 1, 2017: Signs with Stavanger Oilers (Norway); April 29, 2016: Signs 1-year with HPK (Liiga); Oct. 5, 2015: signs with Stavanger Oilers (Norway); Aug. 18, 2014: Signs 1-year contract with Hershey Bears (AHL); Nov. 22, 2013: Traded to Charlotte Checkers; Aug. 7: Signs with San Antonio Rampage. Craig, Graeme – (5 games in 2014-15; remainder of season in Bakersfield-ECHL) Oct. 20, 2016: University of Alberta (via Oilers Now); October, 2015: Playing with Bentley Generals (Chinook Hockey League). Danis, Yann – (2011-12; 2012-13) Retired Feb. 13, 2018; Oct. 17, 2016: Signs 1-year with St. John’s IceCaps (AHL); Septembre 20, 2016: Signs PTO with Anaheim Ducks (NHL); July 3, 2015: Signs 1-year 2-way with New Jersey Devils; Jan. 1, 2015: Signs a PTO with Hartford Wolf Pack; Nov. 11, 2014: Signs PTO with Norfolk Admirals (released Dec. 18th); Oct. 1, 2014: Tryout with Manchester Monarchs – Released; July 5, 2013: Signs 1-yr 2-way with Philadelphia Flyers. Davidson, Brandon – (2012-13 through 2014-15) Sept. 27, 2018: Signs 1-year with Chicago Blackhawks (NHL); Feb. 24, 2018: Traded to New York Islanders (NHL); Dec. 3, 2017: Claimed off waivers by Edmonton Oilers; Feb. 28, 2017: Oilers trade Davidson to the Montreal Canadiens (through 2017-18); Feb. 29, 2016: Re-signs a 2-year extension with Edmonton Oilers (2016-17/2017-18); July 16, 2015: Re-signs 1 year with Edmonton Oilers. Deck, Nathan – (part of 2012-13) Aug. 13, 2017: Joins Lacombe Generals; June 10, 2016: Returns to prohockey, signs with Mora (Allsvenskan), following injury in 2014-15. Last summer (July 24, 2015) he had announced the end of his pro hockey career to become a firefighter on Instagram due to head injuries – later in 2016 joined the Bentley Generals in the Senior ice hockey Chinook Hockey League for a few games; April 25, 2014: Signs with Mora (Allsvenskan); Jan 31, 2014: Signs with Ravensburg Towerstars (DEL2) ; Aug. 2: Signs with Stockton Thunder. Deslauriers, Jeff – (2010-11) Retired (according to Elite Prospects Sept. 2017); Oct. 23, 2016: Playing with Lacombe Generals (Chinook HL); June 19, 2015: Signs with Augsburger Panther (DEL); Nov. 19, 2014: Signs with Dinamo Riga (KHL); Oct. 6, 2014: Released from tryout; Sept. 30, 2014: Tryout with Bridgeport Sound Tigers; Sept. 26, 2014: Released from LA Kings training camp; Sept. 2, 2014: Rumored to have a tryout with the LA Kings; Oct. 3, 2013: Signs with Wilkes-Barre Scranton Penguins (AHL) following PTO. Eberle, Jordan – (part of 2012-13 NHL Lockout) June 22, 2017: Traded to the New York Islanders (through 2018-19); August 30, 2012: Re-signs 6-yrs with Edmonton Oilers through 2018-19. Erickson, Sean – (PTO 2011-12; 1 game) Retired: April 9, 2016; Oct. 15, 2015: Traded to Rapid City Rush (ECHL); Sept. 29, 2015: Re-signs with Tulsa Oilers (ECHL); July 8, 2014: Re-signs with Rapid City Rush (CHL); Nov. 9, 2013: Signs with Rapid City Rush (CHL); Nov. 3, 2013: Departs the Coventry Blaze (EIHL); June 5, 2013: Signs with Coventry Blaze (EIHL). Ewanyk, Travis – (2013-14; 2014-15) Aug. 28, 2018: Signs with Krefeld Pinguine (DEL); July 6, 2017: Signs with Wichita Thunder (ECHL); Feb. 7, 2017: Traded to Fort Wayne Komets (ECHL); Oct. 11, 2016: Signs with Idaho Steelheads (ECHL); Oct. 5, 2016: Tryout with Utica Comets (AHL)/released; July 27, 2015: traded by the Edmonton Oilers to the Ottawa Senators. Ford, Matthew – (2013-14, 2014-15) Jun. 26, 2018: Re-signs 2-years through 2019-20 with Grand Rapids Griffins (AHL); July 12, 2016: Signs 2-years through 2017-18 with Grand Rapids Griffins (AHL); July 2, 2015: Signs with the Bakersfield Condors. Gazdic, Luke – (5 games in 2014-15) July 2, 2017: Signs 1-year 2-way with Calgary Flames; July 5, 2016: Signs 1-year 2-way with New Jersey Devils (NHL); Edmondon Oilers (2015-16). Gerber, Martin – (2010-11) Retired? ; June 24, 2016: Re-signs 1 year with EHC Kloten (NLA); Sept. 9, 2014: Kloten Flyers extend Gerber for anther season through 2015-16; 2014-15: with Kloten Flyers (NLA) for another season; April 24, 2013: Signs with Kloten Flyers (NLA) for 2 years. Gernat, Martin – (2013-14; 2014-15) Feb. 13, 2018: Extends with Lausanne (NLA) through end of season; Dec. 7, 2017: Loaned to Lausanne (NLA); Nov. 21, 2017: signs with HC Kosice (Slovakia); Oct. 25, 2017: Loaned from HC Sparta Praha to HC Presov (Slovakia2); July 2017: Appears on 2017-18 HC Sparta Praha (Czech) Roster; May 25, 2016: Signs 1-yr with HC Sparta Praha (Czech); Feb. 29, 2016: EDM trades to Anaheim Ducks (San Diego Gulls AHL). Giroux, Alexandre – (2010-11) Aug. 14, 2018: Signs with Thetford Mines Assurancia (LNAH); July 27, 2017: Signs with Grenoble (France); July 18, 2016: Signs with Medveščak Zagreb (KHL); 2015-16: March 1, 2014: Re-signs for 2 years with Ambrì Piotta SA (NLA); June 28, 2013: Signs with Ambrì Piotta SA (NLA). Grant, Triston – (2011-12) Dec. 20, 2017: Signs with Quad City Mallards (ECHL); Oct. 13, 2016: Signs with Wichita Thunder (ECHL); Sept. 30, 2016: Tryout with Wichita Thunder (ECHL); July 6, 2015: Signs with the Grand Rapid Griffins; July 21, 2014: Signs a 1 year AHL Contract with the Milwaukee Admirals; July 8, 2013: Re-signs with the Grand Rapids Griffins. Green, Josh – (2011-12; 2012-13 Captain) Retired (May 15, 2017); February 17, 2016: Re-signs 1 year with KooKoo (Liiga) for 2016-17; July 15, 2015: Signs with KooKoo (Liiga); March 4, 2014: Signs Extension with Tappara Tampere of the Finnish Elite League; Oct. 10: Signs with Tappara Tampere of the Finnish Elite League. Hall, Taylor – (part of 2012-13 NHL Lockout) June 29, 2016: Traded to New Jersey Devils; August 22, 2012: Re-signs for 7-yrs with Edmonton Oilers through 2019-20. Hamilton, Curtis – (2011-12 through 2014-15) Jul. 26, 2018: Signs with Graz 99ers (EBEL); Jan. 22, 2018: SaiPa (Liiga); Jan. 1, 2018: Signs with Tappara (Liiga) – later released; Feb. 15, 2017: Loaned to TPS (Liiga); June 20, 2016: Signs 1-year with SaiPa (Liiga); Sept. 30, 2015: Signs with HC Sparta Praha (Czech). Hamilton, Ryan – (2013-14; 2014-15) Jul. 31, 2018: Announces his retirement and becomes scout for San Jose Sharks (NHL); April 27, 2016: Re-signs for 2-yrs with Bakersfield Condors (AHL) through 2017-18. Hanson, Greger – (3 games in 2014-15) Mar. 23, 2018: Signs 1 year with Krefeld Pinguine (DEL) for 2018-19; Jan. 4, 2018: Signs for remainder of season with Krefeld Pinguine (DEL); Aug. 23, 2017: Signs with San Diego Gulls (AHL); Sept. 21, 2016: Re-signs with Allen Americans (ECHL); Sept. 2, 2015: Re-signs with Allen Americans (ECHL). Hartikainen, Teemu – (2010-11; 2011-12; 2012-13) Mar. 31, 2017: Re-signs 2 more years with Salavat Yulaev 2017-18, 2018-19; April 21, 2015: Signs 2 more years with Salavat Yulaev 2015-16 & 2016-17; 2014-15: Salavat Yulaev for another season; Jan. 31, 2014: Oilers trade rights to Toronto Maple Leafs; June 10, 2013; Signs with Salavat Yulaev for 2 years (KHL). Helmer, Bryan – (Part of 2010-11; 2011-12 Captain) July 21, 2016: Named Hershey Bears VP of Hockey Operations; Sept. 30, 2016: Selected into AHL Hall of Fame; June 19, 2015: Re-signs multi-year contract with Hershey Bears as Assistant Coach; July 2, 2014: Accepts position as Assistant Coach with the Hershey Bears (Washington Capitals); July 22, 2013: Accepts Assistant Coach position with the OHL’s Peterborough Petes in Ontario. Retired. Holmberg, Mitch – (ATO at end of 2013-14, 1 game) Amateur Scout for Edmonton Oilers (2017-18 – ); Mar. 9, 2017: Traded to Wheeling Nailers (ECHL); Dec. 18, 2016: Traded to Colorado Eagles (ECHL); July 28, 2016: Signs with Wichita Thunder (ECHL); August 24, 2015: Signs with Székesfehérvár II (MOL Liga). Hotham, Andrew – (Part of 2012-13) July 28, 2017: Re-signs with Cardiff Devils (EIHL); July 8, 2016: Re-signs with Cardiff Devils (EIHL); August 12, 2015: re-signs with Cardiff Devils (EIHL); July 23, 2014: Signs with Cardiff Devils (EIHL); June 23, 2013: Signs with Düsseldorf EG (DEG) – Online Kicker article. Houck, Jackson – (ATO for 7 games 2014-15) Aug. 30, 2017: Commits to Acadia University, joins Acadia Axemen; Nov. 2, 2016: Signs with Colorado Eagles (ECHL); Sept. 20, 2016: Signs Training Camp ATO with Colordao Avalanche (NHL); WHL Juniors. House, Tanner – (ATO for 6 games 2010-11; 2011-12; 2012-13) Retired; Inactive in pros since 2012-13 OKC Barons; January 2016 – plays in the Senior AAA league with the Stony Plain Eagles while working in finance industry in Calgary, AB. Hovinen, Niko – (Part of 2012-13) Dec. 21, 2018: Re-signs for 1 year with KalPa (Liiga) through 2018-19; May 8, 2017: Signs 1-year with KalPa (Liiga); Jan. 25, 2017: Signs with KooKoo (Liiga); Nov. 15, 2016: Signs with KalPa (Liiga) through end Dec.; June 13, 2016: Signs with Medvescak Zagreb (KHL); Sept. 25, 2015: Signs with Pelicans (Liiga); August 13, 2015: signs 1-month contract with Kärpät (Liiga); Dec. 27, 2014: Signs with Luleå (SHL); Dec. 16, 2014: Short-term contract with Salzburg expired; Nov. 3, 2014: Signs with EC Salzburg (Austria); May 8, 2013: Signed with Metallurg Novokuznetsk (KHL). Hunter, Eric – (part of 2012-13) Retired: Mar. 11, 2017: Rumor that Hunter has retired; March 30, 2016: Re-signs with Villacher SV (Austria); March 25, 2015: Re-signs with Villacher SV (Austria); Mar. 31, 2014: Signs extension with Villacher SV (Austria); Jan. 14, 2014: Signs with Villacher SV (Austria); Oct. 12, 2013: Signs with Herning Blue Fox (Danish Metal Ligaen); Oct. 4, 2013: Players rights acquired by Colorado Eagles from Toledo (ECHL). Jones, Connor – (2014-15) July 27, 2017: Re-signs 1-year 2-way contract with New York Islanders; Feb. 22, 2017: Signs 2-way contract with New York Islanders; July 18, 2016: Re-signs AHL contract with Bridgeport Sound Tigers (AHL); Dec. 6, 2015: Signs AHL contract with Bridgeport Sound Tigers (AHL); Sept. 27, 2015: Signs PTO with Bridgeport Sound Tigers (AHL); Sept. 24, 2015: Signs with Missouri Mavericks (ECHL). Jones, Kellen – (2014-15) July 9, 2018: Signs 1-year with Västerviks IK (Allsvenskan); Sept. 12, 2017: Signs with Bridgeport Sound Tigers (AHL); July 5, 2016: Signs with Bridgeport Sound Tigers (AHL); June 13, 2016: Greenville Swamp Rabbits acquire Jones’ rights to complete earlier trade from Missouri Mavericks (ECHL); Nov. 23, 2015: Signs PTO with Bakersfield Condors (AHL); Sept. 24, 2015: Signs with Missouri Mavericks (ECHL). Jones, Ryan – (4 games 2013-14) Jan. 12, 2016: Re-signs for 2 years through 2018-19 with Kölner Haie (DEL); Feb. 19, 2015: Re-signs (2 yrs through 2016-17) with Kölner Haie (DEL); Nov. 17, 2014: Signs with Kölner Haie (DEL); Oct. 9 2014: Signs PTO with Utica Comets (AHL)/ Released. Keller, Ryan – (2011-12) July 2016: Assistant Coach with the Saskatoon Blades (WHL); Retired: July 14, 2016: Announces his retirement; April 12, 2015: Re-signs with ZSC Lions (NLA); 2014-15: ZSC Lions (NLA); July 19, 2013: Signs 2-years with ZSC Lions (NLA); June 21: Keller is exploring options to play in North America and will most likely not return to Genève-Servette next season; Sept. 10, 2012: Signs 2 years with Genève-Servette (NLA). Kessy, Kale – (2014-15) Mar. 6, 2018: Traded to the Cleveland Monsters (AHL); Aug. 10, 2017: Signs 1-year with Manitoba Moose (AHL); Oct. 2, 2016: Signs with Tulsa Oilers (ECHL); Edmonton Oilers/Bakersfield Condors through 2015-16. Khaira, Jujhar – (2014-15) June 16, 2017: Re-signs for 2-years 1-way with Edmonton Oilers through 2018-19; Edmonton Oilers/Bakersfield Condors through 2016-17. Klefbom, Oscar – (parts of 2013-14 & 2014-15) Through 2022-23 – Sept. 20, 2015: Re-signs for 7 years with the Edmonton Oilers (7 yrs @ $4.167M Modified NTC (8 teams) in final 2 yrs). Kytnár, Milan – (2010-11; part of 2011-12): May 24, 2018: Re-signs with HKM Zvolen (Slovakia); July 19, 2017: Signs with HKM Zvolen (Slovakia); June 20, 2016: Signs with HC Nové Zámky (Slovakia); Sept 9, 2014: Signs with HC Banska Bystrica (Slovakia) through 2015-16 ; Sept. 18, 2013: Signs with HC Karlovy Vary (Czech); May 26, 2013: Departed HC Slovan Bratislava (KHL). LaBarbera, Jason – (2 games in 2013-14) Retired: July 19, 2016: Retires from playing; announced as new goaltending Coach for Calgary Hitmen (WHL); July 2, 2015: Signs 1-year 2-way with Philadelphia Flyers; July 1, 2014: Signs 1-year with Anaheim Ducks; Dec. 14, 2013: Oilers traded to Chicago Blackhawks/ Rockford Ice Hogs. Lafranchise, Kane – (part of 2012-13; 9 games) July 1, 2017: Signs 1-year 2-way with New York Islanders; July 18, 2016: Re-signs AHL contract with Bridgeport Sound Tigers (AHL); July 2, 2015: Signs with the Bridgeport Sound Tigers (AHL), later assigned to Missouri Mavericks (ECHL); July 11, 2014: Signs with the Utica Comets (AHL); August 16, 2013: Re-signs with Alaska Aces (ECHL). LaLeggia, Joey – (5 games in 2014-15) Jul. 2, 2018: Signs 2-years 2-way with St. Louis Blues; July 13, 2017: Signs 1-year 2-way extension with Edmonton Oilers; Edmonton Oilers/Bakersfield Condors through 2016-17. Lamoureux, Mario – (3 games in 2013-14) Apr. 27, 2018: Signs with HC Innsbruck (EBEL) for 2018-19; Feb. 19, 2018: Signs with Graz 99ers (EBEL); Nov. 26, 2017: Signs with Winterthur (NLB); July 20, 2017: Signs with Frisk Asker (Norway); May 22, 2016: Signs with HC Innsbruck (Austria); June 20, 2015: Signs with Esbjerg (Denmark); Oct. 28, 2014: Acquired by Quad City Mallards from Ontario (ECHL) for future considerations; Oct. 2, 2014: Tryout with Adirondack Flames – Released Oct. 9; Feb. 19, 2014: Signs with Villacher SV (Austria); Oct. 29, 2013: Signs a PTO with the OKC Barons, on loan from Ontario Reign (ECHL). Lander, Anton – (2011-12, 2012-13, 2013-14 Captain, 2014-15 Captain) May 25, 2017: Signs 2-years with Ak Bars Kazan (KHL) through 2018-19 (officially announced July 10, 2017); April 4, 2015: Re-signs for 2-yrs with Edmonton Oilers through 2016-17. Larsen, Philip – (part of 2013-14) Feb. 2, 2018: Re-signs 1-year with Salavat Yulaev (KHL) through 2019-20; April 20, 2017: Signs 2-years with Salavat Yulaev KHL for 2017-18 & 2018-19; July 1, 2016: Signs 1-year 1-way with Vancouver Canucks; Feb. 25, 2016: EDM trades his rights to Vancouver Canucks; May 25, 2015: Signs with Jokerit (KHL); May 28, 2014: Signs a 1-year contract with Yugra Khanty-Mansiysk (KHL) (June 30, 2014: Given a Qualifying Offer by the Oilers). Lavoie, Alex – (7 games in 2013-14 on a PTO from Allen Americans-CHL team) Jun. 20, 2018: Signs with HC Innsbruck (EBEL); Oct. 31, 2017: Signs with Timrå IK (Allsvenskan); May 10, 2017: Signs 1-year plus option to renew with KalPa (Liiga); Aug. 24, 2016: Signs with BIK Karlskoga (Allsvenskan); Sept. 23, 2015: Traded to Indy Fuel (ECHL); August 1, 2014: Signs with the Florida Everblades (ECHL). Leach, Joey – (6 games in 2013-14) Aug. 8, 2018: Re-signs with South Carolina Stingrays (ECHL); Aug. 30, 2017: Signs with South Carolina Stingrays (ECHL); July 8, 2016: Re-signs 1-year with Hershey Bears (AHL); August 21, 2015: Signs 1-yr with Hershey Bears (AHL), played much of season in ECHL with SC Stringrays; Sept. 15, 2014: Signs with Lake Erie Monsters (AHL); 2013-14 Played in Bakersfield for most of season. Lindemulder, Ben – (AHL SPC 2014-15, no games) Retired: Physiotherapist in Alberta; Dec. 11, 2014: Signs AHL SPC, assigned to Bakersfield Condors (ECHL). Ling, David – (PTO 3 games in 2014-15) Jan. 7, 2018: Signs with Brampton Beast (ECHL); 2017-18: Hamilton Steelhawks (ACH); Dec. 29, 2016: Signs with Brampton Beast (ECHL); Feb. 10, 2016: Signs with Brampton Beast (ECHL); Oct. 1, 2015: Signs with Nottingham Panthers (EIHL); Mar. 24, 2015: Signs PTO for 3 games, loaned from Brampton Beast (ECHL). Lord, Andrew – (Part of 2010-11; 2011-12): 2018-19: Coach for Cardiff Devils (EIHL); Sept. 30, 2016: Cardiff Devils extend Lord’s contract through 2018-19; June 26, 2014: Signs to be Player-Coach with Cardiff Devils (EIHL); May 1, 2013: Signs with the Cardiff Devils (EIHL); July 8, 2012: Signs with SC Riessersee (DEL2). Lowery, Ryan – (part of 2011-12) Retired; 2012-13 with SC Stingrays (ECHL). Lyon, Brett – (PTO for 1 game in 2014-15) Retired; Mar. 24, 2015: Signs PTO for 1 game, loaned from Brampton Beast (ECHL). MacIntyre, Steve – (most of 2013-14) Retired – training to be firefighter Oct. 2015: Sept 11, 2014: Signs with the Norfolk Admirals (AHL); Retired; Nov. 22, 2013: Oilers reassign to OKC Barons. Marcou, Mike (2 games in 2011; ATO with Barons) 2018-19: Named Assistant Coach for Reading Royals (ECHL); 2017-18: Assistant Coach for P.A.L. Junior Islanders (NCDC); July 3, 2016: Re-signs with Reading Royals (ECHL); Dec. 17, 2015: Signed to AHL contract with LeHigh Valley Phantoms, reassigned to Reading Royals; August 5, 2015: Signs with Graz 99ers (Austria); July 31, 2015: Tryout/Released from Medveščak Zagreb (KHL); August 14, 2014: Signs with the Reading Royals ;August 7, 2013: Signs with Hartford Wolf Pack and also played with Greenville Road Warriors (ECHL). Marincin, Martin – (Parts of 2011-12 through 2014-15) July 1, 2018: Re-signs 1-year with Toronto Maple Leafs (NHL); July 29, 2016: Re-signs 2-year 1-way with Toronto Maple Leafs (NHL) through 2017-18; July 9, 2015: signs 1-year 1-way with Toronto Maple Leafs; traded by the Edmonton Oilers to the Toronto Maple Leafs (July 2, 2015). Marquardt, Matt – (2010-11) July 31, 2018: Signs with Dundee Stars (EIHL); May 31, 2017: Signs 1-year with Sheffield Steelers (EIHL); July 13, 2016: Signs 1-year with Coventry Blaze (EIHL); Aug. 24, 2015: Re-signs with Florida Everblades (ECHL); Jan. 15, 2015: Signs with Florida Everblades (ECHL); Jan. 14, 2015: Released from ESV Kaufbeuren; Sept. 2, 2014: Signs with ESV Kaufbeuren (DEL2); June 6, 2013: Re-Signs with Charlotte Checkers (AHL 1-way). Martens, Andrew – (12 games in 2011-12; PTO with Barons) Retires Oct. 7, 2014; Aug. 13, 2014: Re-signs with Wichita Thunder (CHL); August 7, 2013: Re-signs with Wichita Thunder (CHL). Martindale, Ryan – (Parts of 2011-12; 2012-13; and 2013-14) July 27, 2017: Signs with MsHK Zilina (Slovakia); July 22, 2016: Signs with Esbjerg Energy (Denmark); Nov. 26, 2015: Signs with Florida Everblades; July 14, 2014: Re-signs 1-year 2-way contract with Florida Panthers; June 30, 2014: Given a Qualifying Offer by Florida Panthers; Jan. 17, 2014: Oilers traded to Florida/San Antonio Rampage. Maylan, Justin – (loaned to OKC; 4 games in 2013-14) July 26, 2017: Signs with Heilbronner Falken (DEL2); July 26, 2016: Signs with Székesfehérvár (EBEL); May 19, 2015: Signs with Val Pusteria (Brunico) (Italy); July 30, 2014: Signs with Gherdëina (Italy). McDonald, Colin – (2010-11) Jun. 19, 2018: Signs with Lehigh Valley Phantoms (AHL); Feb. 27, 2016: Re-signs with Flyers for 2 years (2-way) through 2017-18; July 3, 2015: Signs 1-year 2-way with the Philadelphia Flyers; 2014-15: New York Islanders; March 15, 2013: Signs 2-Year extension with New York Islanders. McFaull, Kendall – (ATO 2 games 2012-13) Jun. 19, 2018: Signs with Belfast Giants (EIHL); Sept. 4, 2013: Signs college commitment with University of Saskatchewan Huskies, through 2016-17. Mele, Tom – (3 games in 2014-15) Oct. 25, 2017: Signs with Milton Keynes Lightning (EIHL); Aug. 14, 2017: Signs with Wheeling Nailers (ECHL); Oct. 25, 2016: Signs with Cincinnati Cyclones (ECHL); Jan. 16, 2016: Traded to Cincinnati Cyclones from Norfolk; Oct. 15, 2015: Traded to Norfolk Admirals (ECHL) from Tulsa Oilers. Miller, Greg – (4 games in 2013-14) Retired (according to Elite Prospects); Sept. 17, 2014: Signs with the Orlando Solar Bears (ECHL) and loaned to Portland Pirates for part of season. Montgomery, Kevin – (Part of 2010-11; 2011-12) Aug. 14, 2018: Signs with Atlanta Gladiators (ECHL); June 14, 2017: Re-signs 1-year with Rødovre Mighty Bulls (Denmark) – did not play in 2016-17 due to injury; Dec. 30, 2016: Coach of Rødovre Mighty Bulls (Denmark) – Replaced head coach Jesper Duus; August 5, 2016: Signs 1-year with Rødovre Mighty Bulls (Denmark); Sept. 2, 2015: Signs with Florida Everblades (ECHL); Jan. 21, 2015: Signs with Valpellice (Italy); Nov. 7,2014: Signs with Kaltern/Caldaro (Italy); August 4, 2014: Signs with HC Banská Bystrica from Slovak Extraliga for 2014-15 season per Julius Koval, his agent; May 10, 2013: Signs with EC Dornbirner (EBEL Austria). Moran, Brad – (2010-11) Retired Apr. 21, 2017; August 14, 2015: Signs with the Nottingham Panthers (EIHL); April 16, 2014: Re-signs with EHC Linz Black Wings (EBEL Austria); April 17: Signs with EHC Linz Black Wings (EBEL Austria). Moroz, Mitch – (2014-15) Jun. 28, 2018: Re-signs with Idaho Steelheads (ECHL); Aug. 17, 2017: Signs with Idaho Steelheads (ECHL); Feb. 1, 2017: Traded to Arizona Coyotes ; Edmonton Oilers / Bakersfield Condors through 2016-17. Motin, Johan – (2010-11; Part of 2011-12) May 2, 2018: Signs 1-year with HIFK (Liiga); May 29, 2017: Signs 1-year with Lukko (Liiga); Dec. 29, 2014: Signs 2 years with Örebro HK (SHL) through 2016-17; April 26, 2012: Transferred from Timrå IK to Örebro HK (Allsvenken) for 2012-13 season; Örebro now promoted to SHL. Musil, David – (2013-14; 2014-15) May 22, 2018: Re-signs with Hc Ocelari Trinec (Czech); July 31, 2017: Signs with HC Ocelari Trinec (Czech); July 29, 2016: Re-signs 1-year 2-way with Edmonton Oilers; Edmonton Oilers/Bakersfield Condors through 2015-16. Nesbitt, Derek – (part of 2013-14) July 19, 2018: Re-signs with Atlanta Gladiators (ECHL); July 27, 2017: Re-signs with Atlanta Gladiators (ECHL); July 14, 2016: Re-signs with Atlanta Gladiators (ECHL); August 1, 2015: Signs with Gwinnett Gladiators (ECHL); August 20, 2014: Signs with HC Bolzano (Austria); Jan. 17, 2014: Traded to San Antonio Rampage and on Feb. 8, 2014 Rampage traded Nesbitt to Chicago Wolves. Noble, Kevin– (PTO 2014-15, no games) May 9, 2018: Re-signs 1-year with Coventry Blaze (EIHL); May 9, 2017: Re-signs 1-year with Coventry Blaze (EIHL); July 29, 2015: Signs 2-years through 2016-17 with Coventry Blaze (EIHL); April 7, 2015: Signs PTO, on loan from Tulsa Oilers (ECHL). Nugent-Hopkins, Ryan – (part of 2012-13 NHL Lockout) Sept. 19, 2013: Re-signs for 7-yrs with Edmonton Oilers through 2020-21. Nurse, Darnell – (5 games in 2013-14) July 25, 2013: Signs 3-yr ELC with Edmonton Oilers through 2017-18. Oesterle, Jordan – (2014-15) July 1, 2017: Signs 2-years 1-way with Chicago Blackhawks through 2018-19; June 20, 2016: Re-signs 1-year 2-way with Edmonton Oilers; Edmonton Oilers/Bakersfield Condors through 2015-16. O’Marra, Ryan – (2010-11; part of 2011-12) Retires April 2015; June 6, 2014: Signs with Coventry Blaze (EIHL); Sept. 25, 2013: Signs with Val Pusteria (Brunico) Italy. Omark, Linus – (part of 2010-11; 2011-12; 2013-14) Mar. 2, 2018: Re-signs for 2 years with Salavat Yulaev (KHL) through 2019-20; August 1, 2016: Re-signs 2 year contract through 2017-18; May 2, 2015: Signs with Salavat Yulaev for 2 seasons 2015-16 & 2016-17; April 1, 2014: Signs with Jokerit (KHL); Feb. 19, 2014: Signed with Luleå for remainder of season; Dec. 19, 2013: Oilers traded to Buffalo Sabres; August 27, 2013: Signs 1-yr 2-way contract with Edmonton Oilers; Previous season with Zug NLA. Pääjärvi, Magnus – (Parts of 2011-12; 2012-13) May 30, 2018: Re-signs 1-year with Ottawa Senators (NHL); Jan. 26, 2018: Claimed off Waivers by Ottawa Senators (NHL); June 29, 2017: Re-signs 1-year 1-way with St. Louis Blues (NHL); July 5, 2016: Re-signs 1 year with St. Louis Blues (NHL); July 8, 2015: 1 yr Extension with St. Louis Blues; 2014-15: St. Louis Blues; August 2, 2013: Signed 2-year extension with St. Louis Blues through 2014-15; July 10, 2013: Oilers traded to St. Louis Blues (with 2014 2nd rd draft pick) for David Perron. Pageau, Nick – (8 games in 2014-15) Jun. 21, 2018: Signs with Karlskrona HK (Allsvenskan); April 18, 2017: Re-signs with Frisk Asker (Norway); June 2, 2016: Signs with Frisk Asker (Norway); Bakersfield Condors (AHL) for 2015-16. Peckham, Theo – (4 games 2012-13) Nov. 2017: Hamilton Steelhawks (ACH); Oct. 23, 2016: Playing with Saugeen Shores Winterhawks (WOAA); Sept 30, 2016: Released by Rapid City (ECHL); Sept. 26, 2016: Signs with Rapid City Rush (ECHL); Oct. 8, 2015: Signs with Wichita Thunder (ECHL); August 26, 2015: Backs out of Nottingham contract; May 27, 2015: signs with the Nottingham Panthers (EIHL); Oct. 10, 2014: Signs with Wichita Thunder (ECHL); July 19, 2013: Signed by the Chicago Blackhawks; re-assigned to the Rockford IceHogs (AHL). Pelšs, Kristiāns – (part of 2012-13) Deceased 2013; May 1, 2012: Signs 3-yr ELC with Edmonton Oilers. Petiot, Richard – (2010-11) Retired; St. John’s IceCaps in 2012-13. Petrell, Lennart – (2011-12) May 8, 2017: Re-signs for 2-years with HIFK (Liiga) through 2018-19; May 12, 2016: Signs 1-year with HIFK (Liiga); May 16, 2014: Petrell tweets he signs a 2-year contract with Luleå (SHL); August 14: Signs 1-yr with Genève-Servette (NLA); July 19: Rumor that Genève-Servette (NLA) has offered a contract; Twitter: @lennu37. Petry, Jeff – (Part of 2010-11; 2 games in 2011-12) June 3, 2015: Re-signs with Montréal Canadiens for 6-yrs through 2020-21; Mar. 2, 2015: Traded to the Montréal Canadiens. Pickard, Chet – (Part of 2013-14) April 28, 2017: Signs 2-years with Adler Mannheim (DEL) through 2018-19; April 1, 2016: Re-signs 1-yr with Iserlohn Roosters (DEL); May 22, 2015: Signs with Iserlohn Roosters (DEL); June 10, 2014: Signs with Odense Bulldogs (Denmark Metal Ligaen). Pitlick, Tyler – (2011-12; 2012-13; Part of 2013-14 and 2014-15) July 1, 2017: Signs 3-year 1-way with Dallas Stars (NHL) through 2018-19; June 17, 2016: Re-signs 1-year with Edmonton Oilers for 2016-17; July 16, 2015: Re-signs 1-year with the Edmonton Oilers. Pinizzotto, Steve – (Part of 2013-14 and 2014-15) Jun. 13, 2018: Signs with Kölner Haie (DEL); According to Elite Prospects with Red Bull EHC München (DEL) through 2017-18; May 26, 2015: signs with EHC Red Bull München (DEL). Pitton, Bryan – (Part of 2010-11, 8 games) Retired: According to Elite Prospects Dec. 13, 2017; Oct. 13, 2016: Signs PTO with St. John’s IceCaps (AHL); Sept. 17, 2016: Signs PTO with Ottawa Senators; Signs with Brampton Beast (ECHL) for 2016-17 season; Sept. 3, 2015: Signs with Brampton Beast (ECHL); June 22, 2014: Signs with KH Sanok (Poland); August 14, 2013: Signs with Allen Americans (CHL); 2012-13 with Fife (Fife Flyers EIHL). Pitton, Jason – (PTO for 1 game in 2014-15) Retired: Mar. 26, 2015: Signs PTO, on loan from Brampton Beast (ECHL). Plante, Alex – (2010-11; 2011-12; 2012-13) July 8, 2018: Returns to Anyang Halla Ice Hockey Club for 2018-19; July 6, 2017: Returns to Anyang Halla Ice Hockey Club for 2017-18; May 17, 2016: Returns to Anyang Halla Ice Hockey Club for next season; June 18, 2015: Signs with Anyang Halla Ice Hockey Club (Asia League); April 3, 2014: Signs with Lørenskog (Norway) Brother Tyler, a goaltender, plays for the team as well; July 18: Signs with Dornbirner EC EBEL. Potter, Corey – (Part of 2013-14, 6 games) Mar. 27, 2018: Re-signs 1-year with Kölner Haie (DEL); March 23, 2017: Re-signs 1-year with Kölner Haie (DEL); May 27, 2016: Signs 1-yr with Kölner Haie (DEL); Oct. 2, 2015: Signs 1 yr with Arizona Coyotes & reassigned to AHL Springfield; Sept. 6, 2014: Signs with Calgary Flames (NHL). Reddox, Liam – (2010-11) Through 2018-19 – Aug. 4, 2015: Re-signs with Växjö Lakers (SHL) for 3 years through 2018-19; April 14, 2014: Re-signs with Växjö Lakers (SHL) for 2 years; April 27, 2012: Re-signs with Växjö Lakers (SHL) for 2 years. Rimmer, Ty – (part of 2013-14; 2014-15) May 21, 2018: Signs with Kitzbüheler EC (AlpsHL); Aug. 30, 2017: Signs with Kansas City Mavericks (ECHL); Sept. 21, 2016: Signs with Sterzing/ Vipiteno (AlpsHL); May 27, 2015: Signs with the Bakersfield Condors (AHL). Ringwald, Dan – (2011-12; 2012-13) Inactive: March 6, 2014: Signs extension with EC Bad Nauheim (DEL2); June 19, 2013 : Signs with EC Bad Nauheim (Germany 2). Rodney, Bryan – (Part of 2011-12) Retired (according to Elite Prospects); Jan. 19, 2016: Departed HC Karlovy Vary; Oct. 5, 2015: Signs with HC Karlovy Vary (Czech); Oct. 8, 2014: Signs with HC Bolzano (Austria); June 29, 2013: Signs 1-yr 2-way with Nashville Predators. Roy, Olivier – (Parts of 2011-12; 2012-13; 2013-14) Mar. 2, 2018: Re-signs with Augsburger Panther (DEL); Nov. 30, 2017: Signs with Augsburger Panther (DEL); June 28, 2017: Signs 1-year with Eispirate Crimmitschau (DEL2); April 14, 2016: Signs with Villacher SV (EBEL); July 29, 2015: signs with Olimpija Ljubljana (Austria); Sept. 30, 2014: Signs with the Idaho Steelheads (ECHL); June 30, 2014: No Qualifying Offer from Flames; Nov. 8, 2014: Oilers traded to Calgary Flames/Abbotsford Heat/Alaska Aces. Ryan, Joey – (1 game in 2010-11) Retired; 2012-13 with Toledo Walleye (ECHL). Schaber, Chase – (PTO for 13 games in 2014-15) July 2, 2018: Re-signs 1-year with Fife Flyers (EIHL); Aug. 15, 2017: Re-signs with Fife Flyers (EIHL); August 2, 2016: Signs with Fife Flyers (EIHL); Retired (according to Elite Prospects): Feb. 12, 2015: Signs PTO, on loan from Bakersfield Condors (ECHL). Simpson, Dillon – (2014-15) July 1, 2018: Signs 2-year 2-way with Columbus Blue Jackets (NHL); July 16, 2017: Re-signed to 1 year 2-way extension with Edmonton Oilers; Edmonton Oilers/Bakersfield Condors through 2016-17. Stafford, Garrett – (Part of 2012-13) Retired (according to Elite Prospects); June 3, 2014: Signs with Ässät (Liiga); Dec. 23: Signs with Genève-Servette;June 12: signs 2-yr contract with Färjestad (Elitserien). Stortini, Zack – (Part of 2010-11) July 5, 2018: Re-signs with Charlotte Checkers (AHL); July 5, 2017: Signs with Charlotte Checkers (AHL); Jan. 24, 2017: Traded to the San Jose Sharks; July 1, 2015: Signs 2-year 2-way with the Ottawa Senators through 2016-17; July 2, 2014: Signs a 1-yr 2-way with the Philadelphia Flyers; July 9, 2013: Signs with Anaheim Ducks (Norfolk Admirals) 1 yr 2-way contract. Taylor, Jake – (2010-11) Retired; Inactive post 2010-11 season. Teubert, Colten – (part of 2010-11; 2011-12; 2012-13) April 19, 2016: Signs 2-years with Nürnberg Ice Tigers (DEL) through 2018-19 (Skipped 2017-18 season); Feb. 14, 2014: Extends his contract with Iserlohn Roosters (DEL) for 2 seasons; Sept 29: Signs 1 yr contract with Iserlohn Roosters (DEL). Tremblay, Hunter – (end of 2010-11; 2011-12) Retired; Inactive post St. John’s – 2012-13. Tremblay, Nicholas – (Played 1 game 2013-14) Retired: Sept. 2014: Retires — training to become an investment advisor with Assante Wealth Management; Feb. 19, 2014: OKC trades Tremblay for Greg Miller with Bridgeport Sound Tigers. Tremblay had played with Bakersfield Condors. Tulupov, Kirill – (2011-12) Retired: April 29, 2016: Signs 1+1 contract (includes end of year trial) with HPK (Liiga); Jan. 26, 2016: Signs with Rivière-du-Loup 3L (LNAH) & won 2016 League Cup; July 2, 2015: Signs with the Rapid City Rush (ECHL); Nov. 4, 2014: Signs with Wichita Thunder (ECHL); Sept. 9, 2014: Signing announced with Vityaz Podolsk (KHL); Aug. 28, 2014: Signs tryout with Vityaz Podolsk (KHL); Feb. 2, 2014: Signs with Frederikshavn White Hawks (ML); Oct. 8, 2013: Signs with Gwinnett Gladiators (ECHL). Tuohimaa, Frans – (Part of 2013-14 & 2014-15) Oct. 27, 2017: Re-signs 1 year with SaiPa (Liiga) through 2018-19; April 21, 2016: Signs 2 years with SaiPa (Liiga) through 2017-18; May 18, 2015: Signs with Leksands (Allsvenskan). Tyrvainen, Antti – (2011-12; 2012-13) Jan. 17, 2018: Re-signs for 1 year with Pelicans (Liiga); Oct. 11, 2016: Signs 2 years through 2017-18 with Pelicans (Liiga); Dec. 18, 2015: Signs with Färjestad BK (SHL); May 2, 2015: Re-signs 2 years with Ilves (Liiga) through 2016-17; April 24, 2014: Signs with Ilves (Liiga); June 6, 2013: Signs with SM-liiga Jokerit Helsinki. VandeVelde, Chris – (2010-11; 2011-12; 2012-13) May 14, 2018: Signs with Red Bull EC Salzburg (EBEL); Nov. 30, 2017: Signs with Lukko (Liiga); Sept. 11, 2017: Signs a PTO with Ottawa Senators; July 29, 2015: Re-signs 2-yrs with Philadelphia Flyers through 2016-17; July 4, 2014: Re-signs 1-yr 2-way with Philadelphia Flyers; Dec. 12, 2013: Signs NHL contract with the Philadelphia Flyers; Sept. 13, 2013: Signs with Adirondack Phantoms (Philadelphia Flyers AHL team). Williams, Jason – (2014-15) Nov. 2017: Brantford Blast (ACH); Dec. 6, 2016: Signs with Nottingham Panthers (EIHL); Oct. 28, 2016: Signs with Ritten/Renon (AlpsHL) for the Continental Cup (mid November); July 16, 2015: signs with Kölner Haie (DEL). Winchester, Brad – (Part of 2014-15) Retired Sept 17, 2015; March 6, 2015: Traded to OKC Barons (AHL) from Norfolk Admirals (AHL). Winquist, Josh- (most of 2013-14, part of 2014-15) July 26, 2018: Signs with Colorado Eagles (AHL); July 15, 2017: Signs 2-way AHL contract with Toronto Marlies (AHL); July 5, 2016: Signs with Bridgeport Sound Tigers (AHL); July 2, 2015: Signs with the Bakersfield Condors. Yakimov, Bogdan – (2014-15) Feb. 8, 2018: Re-signs a 2-year extension with Neftekhimik Nezhnekamsk (KHL) through 2019-20; April 4, 2017: Extends 1-year with Neftekhimik Nezhnekamsk (KHL) for 2017-18; July 27, 2016: Loaned to Neftekhimik Nezhnekamsk (KHL); Dec. 21, 2015: Loaned to Neftekhimik Nezhnekamsk (KHL); Edmonton Oilers/Bakersfield Condors through 2016-17. Zahn, Teigan – (5 games 2012-13) July 25, 2018: Signs with Utah Grizzlies (ECHL); Sept. 25, 2017: Re-signs with Colorado Eagles (ECHL); July 28, 2016: Re-signs with Colorado Eagles (ECHL); June 22, 2015: Re-signs with Colorado Eagles; Aug. 18, 2014: Signs with Colorado Eagles (ECHL); Oct. 4, 2013: Assigned to Utah Grizzlies (ECHL) by Norfolk Admirals (AHL).